Pantry Moth Traps that Work : Control Indian Meal Moth problems today. A Moth Trap is cost effective pantry pest control. Pantry Moths (little brown pantry bugs) that can be trapped by a pheromone trap include: Mediterranean flour moth, indian meal moths, flour moths and most other food pantry moths found in your kitchen cupboard! (including weevils, and cigarette beetles). Pantry moths in your cupboard? Little bugs in your pasta, corn starch or peanuts? Bird seed moths in the garage? Say Hello to the Indianmeal moth ( Plodia interpunctella ) a common pantry pest. A moth infestation in house kitchen pantry is able to cause food waste; but you can catch and get rid of pantry moths! Moth Traps make Trapping moths easy! Where can you buy moth pheromone traps for effective natural moth control? Right here! Get moths out of your kitchen using nature! 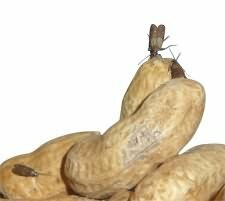 The natural pheromone pantry pest trap is the secret to moth control without poisons. The secret to pantry moth traps is the use of a female moth pheromone which attracts and traps the male moth, and breaks the reproduction life cycle. If moths don't mate, then you won't find any Moth Larvae (pale white 'waxworms' about 1/2 inch long). No moth larvae = no adult moths. 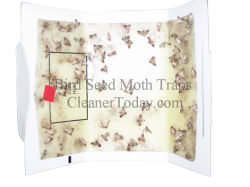 Pheromone powered moth glue traps - the secret to simple, sage moth removal powered by natural instincts. Choose Professional Strength Nature powered Catchmaster moth traps when trapping and exterminating pantry pests moths. Catchmaster natural moth traps for food and pantry moths emit a time released moth pheromone which a male indian meal moth is able to sense. Once the trap catches the moth the super sticky moth trap glue prevents that male moth from reproducing which means no moth larvae, and over several cycles ends the moth infestation. Moth Pheromone Traps scientifically proven to be able to lure food moths ( indian meal moth, mediterranean flour moth, bird seed moths, grain moths, kitchen moth, etc) commonly found in a pantry and food storage areas. Moth larvae can infest your house and turn dog food, bird seed and other store bought grains into a home moth depot, but kitchen moth traps can catch and control them! What others have to say about Effective Home Moth traps for pantry pests and food moths? How did others find out about a catchmaster moth trap? What can I do to get moths out of my cupboard? How do I kill pantry moths? Which moth traps are best for killing moths? Do I have a moth larvae, pantry worms or weevil infestation? Explore information about getting rid of moths using Moth traps! Difference between pantry moth traps , Indian Meal Moth traps, flour moth traps? Most moth traps are described by the trap location or the type of food a moth can be found in. this includes food based moth traps: bird seed moth trap, indian meal moth trap, flour moth traps, pasta, oatmeal, wheat and cereal grain moth traps. Getting rid of pantry bugs using moth control technology is the same regardless of the type of pantry pest, extermination using moth pheromone traps is able to lure & catch any variation of the indian meal moth regardless of location. Special Note: We don't carry clothes moth traps: We have not been able to find a high quality clothes moths trap or moth repellants. The catchmaster pantry moth trap is designed to work with Food and Pantry Moths which includes any indoor moth except those found in closets and fabrics. Some moth traps include free priority shipping or if you spend over $35 on products (including moth traps) free shipping is included. I have had a persistent problem in my pantry with an indian meal moth infestation. I tried everything i was able to with minimal effect. then I bought the catchmaster pantry pest moth traps and I'm certain I'll have complete elimination in short order! Shipping was fast and the web site is user friendly. I"ll definitely recommend this site to other people! About our Pantry Moth Traps: Cleanertoday does not sell through Amazon, Walmart or other big box stores.